We have pleasure in introducing The i Book of Children's Puzzles. 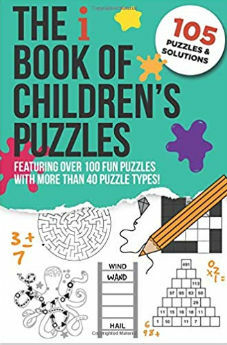 This book makes the ideal gift for any young puzzle lover, and is targeted approximately at the 8-12 year age range, although younger and older puzzlers should also find something to enjoy. It is also suitable for those who may not have necessarily solved puzzles before, but you think would enjoy the challenge. It aims to be both fun and educational. Secret word: a wordsearch with a twist! Riddles: can you crack them? The i Book of Children's Puzzles is available to buy now, and we'd love to hear what you think of it. So, if you have any comments or requests for future puzzle books, then please do just let us know.